A NOOSE Cruiser in a roadblock on the Algonquin Bridge in GTA IV. 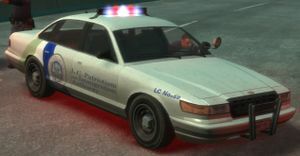 The NOOSE Cruiser is the NOOSE variant of the Police Cruiser, appearing in Grand Theft Auto IV. The NOOSE Cruiser shares the chassis of the Police Cruiser (based on a combination of Ford Crown Victorias), albeit with an LED strobe light bar in place of the Police Cruiser's spinning V-bar, and a NOOSE livery (loosely based on the livery of Homeland Security vehicles) rather than that of the LCPD; however, the car is similarly equipped with a police computer that allows the player to engage in Vigilante-like side missions. The NOOSE Cruiser may be called out when a 3-star wanted level is attained, and is used to create roadblocks. The car serves roughly the same purpose as the NOOSE Patriot. In The Ballad of Gay Tony, the NOOSE Cruiser appears to spawn more often than in GTA IV when the player is being chased by the police. It even goes as far as to replace Police Cruisers, which are usually the designated pursuit vehicles when wanted by the police. When compared to the Police Cruiser, the NOOSE Cruiser appears to have undergone a pleasant array of upgrades. The engine feels as if it's breathing better, and its powerband is improved dramatically. The suspension is firmer, the body roll is not as severe. Handling-wise, this huge car can match more performance-oriented cars, and stability at its top speed is vastly different from the Police Cruiser. The NOOSE Cruiser's LED light bar does not make a distorted sound after being crushed or shot at with a weapon like the Police Cruiser's/Patrol's V-bar. This page was last modified on 12 November 2012, at 08:29.